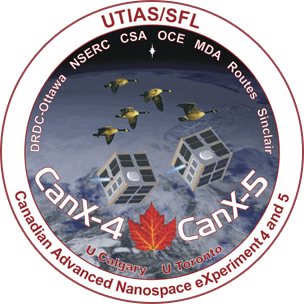 CanX-4 and CanX-5 are a pair of identical nanosatellites that will use the technology qualified aboard CanX-2 to perform formation flight. This mission will demonstrate centimeter-level accurate position determination and autonomous formation maintenance. The background is an image of the Canadian Arctic. This is one of many beautiful regions of Canada that would benefit from the remote sensing capabilities of satellites using formation flying techniques that will be demonstrated in this dual-nanosatellite mission. Flocks of Canada geese are easily recognized when they fly overhead in their natural V-shaped formation. This symbolizes the autonomous formation flying that will be accomplished by CanX-4 and CanX-5. The star shown represents Polaris (the North Star) and guidance and navigation techniques critical for autonomous formation flight. The two nanosatellites are CanX-4 and CanX-5, and the plumes represent the thrusts from the second-generation of Nanosatellite propulsion system being developed at UTIAS/SFL. Autonomous formation maintenance and control strategies are being developed by the Spacecraft Dynamics and Control group at the University of Toronto Institute for Aerospace Studies under the direction of Prof. Christopher Damaren. High-accuracy position determination using advanced GPS signal processing techniques is being developed at the University of Calgary by Prof. Elizabeth Cannon and Prof. Susan Skone.